Classic The Mall is strategically located on the Mall road of Nainital facing the emerald, Naini Lake. Classic The Mall offers picturesque view of the Nainital from lake facing rooms. It serves 25 lake facing rooms and also offers family cottages. Classic The Mall is well equipped with modern amenities and serves the guests ensuring a comfortable and memorable stay. It is an ideal place to stay for families, couples and big friend groups. List of Classic Group of Hotels: Classic The Mall in Nainital, Classic Hilltop in Chamba, Classic Residency in Haridwar and Hotel Classic Diplomat in Delhi. 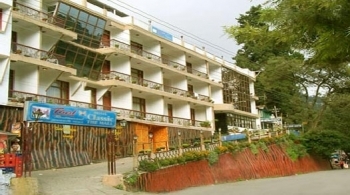 Classic The Mall hotel is situated a few minutes walk from Nainital Bus Stand on The Mall Road. It is situated 40 kms from Kathgodam railway station. Accommodation in Classic The Mall in Nainital is categorized in 6 types of rooms to meet the need of discerning travelers. Deluxe Room, Premium Room and Classic Suite are double bed rooms. Premium Rooms and Classic Suite are both lake facing. Lake Facing Family Suite consists of four beds. There are two more types of family cottages serving two and three rooms. All the rooms are spacious with elegantly done interiors. The room amenities includes cable TV, direct dial telephone, filtered drinking water, room service, attached bath, running hot and cold water and centrally heated rooms. Hotel Classic the Mall houses a multi-cuisine restaurant named as Taal. It serves Indian, Mughlai, Chinese and Continental delicacies. The interior of the restaurant is elegant and the food served is appetizing and aromatic. - Above tariff is subject to charge without prior notice. - Any increase in government leives will be extra. - Driver/Maid/Servant meal charges Rs.250/- per person per day. - No refunds shall be made for short stay, un-availed facilities or part for any services not provided due to technical unused nights or other reasons beyond our control. - All room reservations will be held up to 1800 hrs. only,unless late arrival indicated. - Incase of NO SHOW, NO REFUND will be made. The distance from Delhi to Nainital Bus Stand is 320kms which can be easily covered in 7 hrs of time. Kathgodam is the nearest railway station to Nainital situated 40kms before Classic The Mall. Kathgodam is well connected by railway networks. Nainital is well connected by motorable roads. Buses and taxis to Nainital are easily available from major parts of North India. Buses from ISBT Anand Vihar to Nainital are easily available.